The sound of Brahman is OM. At the end of OM is silence. It is a silence of joy. Which beginning of time [the Creation] according to our Chronologie, fell upon the entrance of the night preceding the twenty third day of October in the year of the Julian Calendar, 710 [4004 B.C.]. The Upanishads did not claim that the universe began in 4004 BC. James Ussher was not commenting about humor. Thorsten Veblen was not advocating childlessness. One must look below each statement and not above to determine the proper attribution. 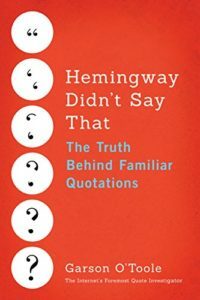 The Penguin Dictionary of Modern Quotations [PGPU] and the Oxford Dictionary of Humorous Quotations [OXPU] both listed Ustinov’s remark properly ascribed and containing the word “bereaved”. Humor is the sense of the Absurd which is despair refusing to take itself seriously. This statement might have appeared immediately adjacent to the quote from Ustinov. Indeed, a thematically organized quote collection would have placed both sayings into the “humor” section. The type of ordering error already discussed might have forged an incorrect linkage between Ustinov’s comment and Arland Ussher. Further sloppiness might have swapped Arland with James Ussher. In conclusion, evidence indicates that Peter Ustinov crafted the expression under investigation. The confusion between Ustinov and Ussher might have been facilitated by spatial proximity on a book page.